Saxophonist, composer and arranger Jim Stranahan retired from teaching after 3+ decades of working with students in the Denver Colorado, area. During that time, he also was a popular free-lance musician working with the likes of Rosemary Clooney, Bob Hope and Lee Konitz. 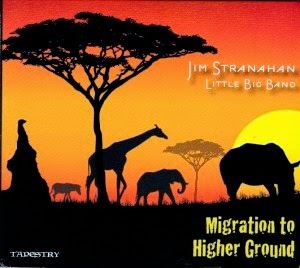 "Migration to Higher Ground: Jim Stranahan Little Big Band" (Tapestry) comes 3 years after his previous recording for the label "Free For All." The 9 tunes include 5 featuring the leader in front of a 11-piece band (the rollicking "Bayou Bounce" adds the sousaphone of Ben Faust); many of the band members also teach in the Denver-area including trumpeters Brad Goode and Hugh Ragin plus the impressive bassist Eduardo "Bijoux" Barbosa. Beside the New Orleans-inspired "..Bounce", the ensemble performs the Afro-Cuban title track, replete with fiery trumpet work, strong drum work from Todd Reid, a melodic/percussive Barbosa solo and a rippling guitar spotlight for Mike Abbott. "Mambo Facil" opens with a saxophone cadenza that is all Stranahan, overdubbing tenor and soprano then leading into a lively montuno. The sweeping brass lines over the "dancing" drums create a splendid frame for the soloists (flutist Joe Anderies stands out). The remaining 2 Little Big Band tracks include the mellow "Paul and Dave", a tribute to Paul Desmond and Dave Brubeck, plus a "swinging" reading of Brubeck's "In Your Own Sweet Way" which features the leader's swooping soprano lines over the responsive counterpoint of the reeds and brass. The other 4 tracks belong to a sextet that features Goode and trombonist Wade Sanders from the larger ensemble plus the rhythm section of pianist Glen Zaleski, bassist Rick Rosato and the leader's son Colin on drums. The rhythm section is also a working group; one can hear that in their interactions and the liveliness of the music. Father Stranahan's alto flies over his son's active drums on "Straight From The Source" and floats his husky tenor sounds gently, but with a strong taste of the blues, on the Monk-inspired "Blues and a Half" (the track also features crisp solos from Goode and Zaleski). The remaining sextet tracks include a rousing rendition of Sonny Rollins' "St. Thomas" which features a smart arrangement from Dad that only hints at the melody until the ensemble wraps it around a splendid drum break. The CD closes with Jim overdubbed 6 times swinging his way through Charlie Parker's "Donna Lee" with the help of the rhythm section - listen for the interaction of the drums with the sax breaks during Zaleski's sprightly solo plus a strong soprano solo. Jim Stranahan shows his strengths as a soloist, arranger and bandleader on "Migration To Higher Ground." He is generous as a leader on the Little Big Band and gets to play more expansively on the Sextet cuts. There is plenty to like on this CD, a worthy successor to his previous Tapestry release. For more information, go to caprirecords.com/artists/jim-stranahan. While I was away this past weekend, saxophonist Eric Wyatt came to The Side Door Jazz Club in Old Lyme, CT for a CD-Release Party celebrating his first United States release, "Borough of Kings" (Posi-Tone Records). In my preview of the show, there's a bit of Wyatt's history (read it here). The recording features Wyatt's working group of Benito Gonzalez (piano), Ameen Saleem (bass) and Shinnosuke Takahashi (drums, mixing engineer) plus guests Duane Eubanks (trumpet on "Can He Come Out"), Kyle Poole (drums on "Can He Come Out") and Clifton Anderson (trombone on "What Would I Do Without You"). The quartet tracks display the influence of John Coltrane and are filled with electricity, sparks flying between the soloists and the delightful rhythm section. The title track shows Takakhashi really driving the band, pushing both Wyatt (on tenor) and Gonzalez to play with fire throughout. Wyatt moves to soprano for the pianist's "Quest", playing a solo that rises high above the forceful rhythm section. Gonzalez, who also works with drummer Franklin Kiermyer and saxophonist Azar Lawrence, often shows the influence of McCoy Tyner, especially in his insistent supportive work and fiery solos. Wyatt's biting tenor sax work is also featured on Mr. Coltrane's "Countdown" and the hard-hitting "One for Hakim", the latter featuring rampaging solos from leader and pianist. There's also quite a splendid saxophone-drums dialogue on that track and plenty of Coltrane quotes as the piece fades. The 2 tracks with the guests have a much different vibe from the Quartet cuts. Eubanks and Poole bring the "funk" on "Can He Come Out" with Wyatt plugging in for a danceable confection - it's fine and dandy but seemingly out of place. The final track, What Would I Do Without You", features the trombone of Anderson and, while it's not as hyperactive as many of the Quartet cuts, Wyatt and his guest bring good energy on the "straight-ahead" groove. 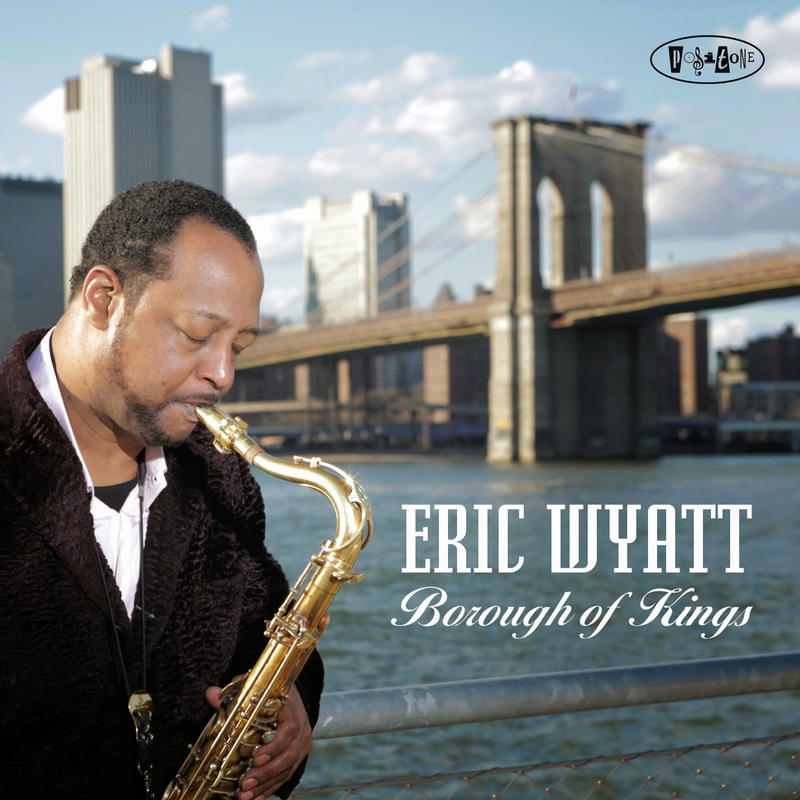 "Borough of Kings" will be most American listeners initial interaction with the music of Eric Wyatt. The majority of the program feels alive and, chances are quite good, this is what the group sounds like in person. This CD is a worthwhile investment of your time and money. For more information, go to www.ericwyatt-music.com.